In the fall of 2018 North America’s largest dining and sightseeing cruise company, Entertainment Cruises, launched the newest boat in its fleet, the Odyssey Chicago River. 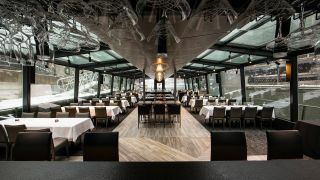 The first dinner cruise on the river, the upscale vessel is glass-enclosed offering 360-degree views of downtown Chicago’s great architecture and stunning skyline. While visually an impressive experience, sonically the project would challenge any audio design team—the glass walls would create a listening environment of poor acoustics with high levels of reverberation if the right sound reinforcement system was not chosen. Inside the boat, OSA supplemented the 16Cs with K-Array Rumble-KU210 subwoofers. A high-power passive sub, the component was chosen for both its performance and size. “I needed to fit the subwoofers into a 7.5-inch deep soffit, and the K-Array was the perfect choice as it is a dual 10-inch subwoofer that is only 6-inches deep,” said Gardner. The d&b 5S loudspeakers are available in special colors, so OSA was able to match the speakers’ surroundings making them less noticeable.